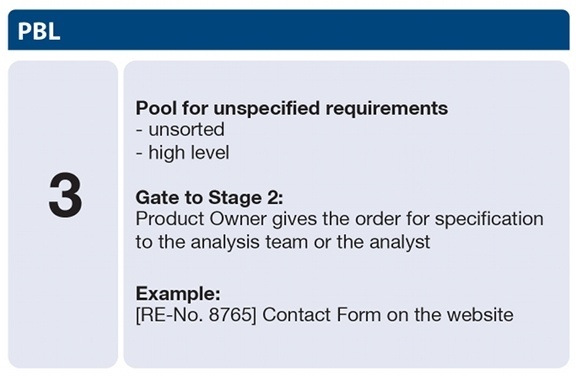 The third stage of the Product Backlog contains all of the requirements which are formulated by the Product Owner Team. The requirements at this stage are not subjected to quality assurance . Requirements described here are very approximate and not yet formulated or prioritized. All types of requirements are included. Requirements and changes (Change Requests) are collected in this stage. After each Sprint, a Sprint Review Meeting takes place with the Team, the Scrum Master and the Product Owner Team. Results from this, which can be formulated as Items, also merge here. Each incorporated entry is given a unique number. At this stage of the Product Backlog, it is not clear if any of the Items should be implemented. Diagram 25 describes the structure of the third stage and the features of the Items included. In this example, the entry is simply a unique number and a brief description. When the Product Owner Team shifts an Item into the next upper level, it equates into an assignment for the analysis team or the analyst; these are members of the Product Owner’s team. The analysis team or the analyst is assigned the task to specify the Item in accordance with the defined quality criteria. This can be implemented as part of a Sprint Task or outside of the Scrum Process and depends on whether the analysis team and the analyst are part of the Development Team. It is important to ensure that the Team is informed early on about the requirements and can contribute.